Read this article to learn the best bank for expats in Madrid and to get the names and contact details for English speaking agents our customers have successfully worked with. We recommend two banks: CaixaBank and Sabadell. No fees and no commissions, even for international transfers within Europe. Transfers to the UK and the US do incur fees. For large transfers outside of the EU, we recommend using a foreign currency specialist. You can save up to 3% using a currency broker. Sabadell gives you back 1% on all utility bills. There is only one condition to keep your account feeless. You must have a minimum of 700€ a month transferred into the account. If you are under 29 years old, there is no minimum transfer requirement. To get started, send an email to Nelida Regueira (sregueira@bancsabadell.com) at the Miguel Angel 23 Branch (Metro Gregorio Marañon). Include a scan of your passport, your telephone number and your home address (it’s ok if it’s not in Spain). 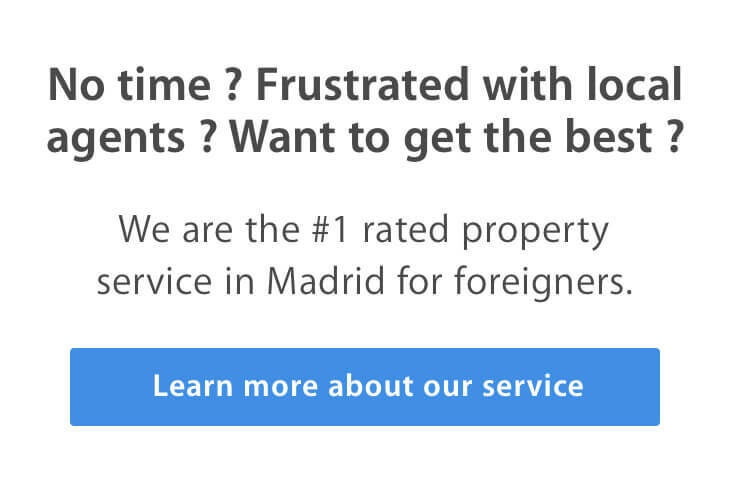 By going through Moving2Madrid, and working with Nelida, you will get special treatment. She will inform you of the special offers they have for Moving2Madrid customers and your account will be opened quickly, even before you arrive in Spain. To keep all the advantages listed above, make sure you get your NIE and send it to them within the first 3 months so you do not get the non-resident tax of 26€ from the Spanish state. You can check the conditions in this summary. CaixaBank is another excellent choice for expats. The bank has the best English resources and an English help line. They offer a special program called HolaBank, which is aimed at international clients. They offer high-value financial support, advice and guidance service tailored to meet your needs. Free Visa&Go card for the first year. Visa&Go is a credit card with deferred payments. The amount spent on the card is repaid in fixed instalments and the outstanding balance does not incur any interest. The maintenance charge is free in the first year, and free in subsequent years as long as you make purchases for an accumulated minimum of €600 a year (€25 a year in other cases). 24 free transfers per year within the EU. Again, transfers to the UK and the US do incur fees. For large transfers outside of the EU, we recommend using a foreign currency specialist. You can save up to 3% using a currency broker. Free conference call/translation services. Their team of interpreters will speak for you on the telephone to help you handle whatever you’re doing. They will also provide simultaneous translation services in English, French, German and Russian. CaixaBank will help you set-up all your utilities when you arrive in Spain. A variety of other non-banking services such as telephone medical service, helping you find domestic staff, a handyman service, etc. To get started, send an email to Almudena Abad (sregueira@bancsabadell.com) at their Calle Velasquez office. Almudena has been oustanding with past clients. If you are looking for a mortgage, Caixa has the best rates and service. Please keep in mind that banking is Spain is still a bit old-fashioned. All major transactions have to be done in person at the office where you opened your account. There is a great variation in service levels and English proficiency. Moving2Madrid vouches for Nelida Arias and the Sabbadell Office at Miguel Angel, 23 in Madrid, and Almudena Abad Cardenas and the Caixa office on Calle Velazaques, in Madrid. They will answer your questions and make things happen. If you contact other offices in Spain, we cannot make any promises regarding the quality of service. If you have any issue, just comment on this post and we will help you get it resolved. I cannot vouch for the rest of Sabadell or Caixa offices in Spain. I know this one, I have requested from them special service and attention. Do contact them, and be sure they will be good. If you have any more questions or doubts about the best banks for expats in Madrid, send us an email today and we can answer your questions. Full disclosure: M2M does not have an exclusive agreement with Sabadell or Caixa. However, both banks reward referrers. Other banks, for instance ING, do the same. We refer our readers to Caixa and Sabadell because both have treated our clients exceptionally well in the past. Moreover, both Almudena and Nelida speak English. Honestly I don’t know. Sabbadell still is great for expats, but this post was written awhile ago and I don’t know if Nelida is still there or not. I would try emailing her. Please report back about your experience! I know about Madrid – Do get in contact with Nelida at ariasnelida@bancsabadell.com to make sure for Granada ! We have bought a house for holidays in the Granada area and need a bank account, we have NIE certificates. Would this account be suitable and is the 26 Euros a yearly charge. First of all thank you for your question and Merry Christmas!!! Hey Pierre, i see you mentioned EVO. I like EVO because of the transparency, i know that with their debit card i will not be charged for extracting money in any ATM in Spain (or in the world). I tried to find the same informations on Sabadell site and got frustrated. Do you know where can i find those informations on sabadell’s site? We can now say that the Miguel Angel Sabadell branch with Nelida is back to giving top notch service. They have requested personally a meeting and committed to answer all requests comming through our recommendation to be responded within 48h. We have been monitoring service in the last months, and we can say it has been top quality. Myself and my team have accounts for personal and business use at Sabadell, and can also personally vouch for their quality. Again, the uniqueness of this bank branch is that they enable us to open the account before you even arrive in Spain, and we can directly request top quality personal service. Do post comments if any of you see any change, good or bad, at the Miguel Angel branch ! Yes, we agree that Sabadell’s service quality has been going down. Therefore, we still recommend them as the easiest account to open when just landed, but recommend ING or EVO for banking further down the road. One thing: the 26 € fee each term is not from the bank, but a tax from Spain for all non-resident bank account. We are in the process of finding another bank who gives our clients and readers the same special treatment as before. We will update the article as soon as ur negotiations are fruitful. Just thought I would offer some recent experience of this; I went to Sabadell on this recommendation, and just be careful are there are “hidden” fees they don’t tell you about until you’re signing! This account is a non-resident account, which is great, you think, as you can open it whilst you are dong the rest of the essential tasks in order to get your official residency… BUT… if you don’t change to a resident account asap they charge 26euros (not sure if this is a month or a quarter, but still!) – they won’t accept padron, NIE, etc, it must be the official residencia, which is a pain to get a suitable appointment for, and apparently you also cannot guarantee how quickly the card or cert arrives in the post, so essentially, Sabadell will charge you! This is NOT made clear at the outset. I have also found the communication poor, it took me numerous emails to Nelida to get her to answer a simple question, and I opened the account weeks ago, but haven’t heard a thing regarding when our debit cards will arrive. Subsequently, I’ve not got much faith in them now and haven’t deposited any funds yet as I am now looking at other banks as I’m overly frustrated by Sabadell & Nelida’s poor service, and will probably close the account down before I’ve even got close to using it. I’ve heard of someone having a positive experience with the Colon branch of Sabadell, but have to say the one advertised here has been far from this, so just be aware things aren’t necessarily as they are portrayed! It depends on both Sabadell and ING. Do contact SILVIA REGUEIRA SAINZ at sregueira@sabadellatlantico.com to get all the details. I am a New Zealander who has just arrived in Spain. I assume I can send money from ING back home and vice versa as required? Do you know what fees are charged? Yes, it is the best option I have found for our clients. Yes, there are fees for transfers from another currency, as always, but this is defined by the bank sending the money. So, there are no fees for transfers from the UK? It just mentions no fees on Euros transferred on their website. I specify Madrid because customer servie differs a lot from branch to branch ! Therefore I recommend one specific branch in Madrid, where I know a specific person, Marie-Hélène, has the level of customer service I have with my clients. And that’s very rare, and the only one I know in Madrid ! Then the bank is indeed the same all around Spain, apart from the specific deal I have got from them for the people I recommend to this branch. So all of this makes it quite location-specific ! If you have any question, just tell me ! Why should there be special treatment for bank customers moving to a specific region? ING is a very good bank, and very interesting if you have a Spanish salary, a NIE and speak Spanish. It’s in fact one of my 3 banks, with Sabadell and Evo. And as always, bad experiences can happen. What I’m sure of is this: please contact Marie-Hélène RoucouMarieHelene@sabadellsolbank.com and tell her everything that went badly. She will try to make it up to you, she has an amazing sense of customer service, speaks 3 languages, and keeps me always in the loop. ING is very efficient via email, but a bit dodgy for speaking English and being personal – no dedicated agent. Hope you find solutions to your banking needs ! Totally agree ! Caixa is not bad in terms of serivce, but the top 3 banks are clearly (according to global ratings and rankings) Santander, Sabadell and BBVA. Caixa is going through some debt issues. But good service indeed ! I had very negative experiences with this bank. It took them three months to give send me my debit card, they subscribed me to a credit without my acknowledgment. Whenever I went to the bank they were very incompetent and rude. Oh and most of the branches are closed during the summer. I’m moving to ING, they have been efficient and helpful. Agree on the Banco Sabadell- Marie-Hélène in the main branch at Miguel Ángel 23 is a great French/English speaking contact. The Caixa isn’t bad either- they have lots of small branches (at the moment!) with mostly young staff who probably speak English. Both banks (as far as I know) are pretty sound- good if you think about the crisis.